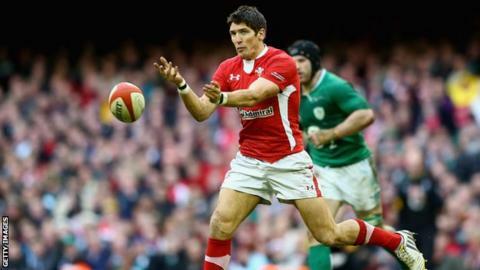 Wales' and Perpignan's James Hook insists he has no regrets about moving to French club rugby. Hook, 28, is not available for Wales' clash with Australia next Saturday as it falls outside the International Rugby Board autumn window. Instead he will play for his club against Clermont Auvergne. "I've no regrets about it [moving to France]. It has enhanced my rugby and I think I'm a better player because of it," said former Osprey Hook. Hook left the Ospreys to join Perpignan at the end of the 2010/11 season and believes he has benefited from his move to France. "It has given me the experience of playing in a different league and got me out of my comfort zone, having to speak a different language and so on," he added. "In an ideal world you want to be available for next week. I'm not, so I just get on with it." Hook does not have a clause in his Perpignan contract that permits release for every Welsh international. Warren Gatland, the Wales coach, has made no secret of his frustration that Hook is not available for all Test matches and training camps. Hook is determined to remind everyone of his ability prior to the Six Nations when he pulls on the Wales number 10 shirt against Tonga on Friday. Hook, who is currently in his third season of a recently extended long-term deal at Stade Aime Giral, will make a first fly-half appearance for Wales since the 2011 World Cup third place play-off defeat against Australia in Auckland. "I didn't know what to expect this week with selection, injuries and things," said Hook, who will win his 73rd cap against Tonga. "Whatever position I had been named in I would have been happy. "I like playing 10, but just to get back starting in the Welsh jersey is the main thing because it has been a while. "I have had a bit of experience the last couple of weeks coming off the bench [against South Africa and Argentina], but it's going to be nice to start against Tonga. "You ask any player and they will tell you they want to be in that starting team all of the time. "You do get frustrated at times, but you have to keep your head and keep working. I am just pleased to have an opportunity on Friday night. "I have never given up hope, but the way the team has played the last couple of years it's been very difficult to get back in that starting line-up. "But I have always had hope and I want to play for Wales until the day I retire." Despite making 11 changes, Wales will start as favourites to beat Tonga for the seventh time in a row.